Meat, fish or vegetables — you can fry and stew all manner of foods to perfection in our frying pans. WMF frying pans deliver great results, with or without a coating. Each frying pan has its advantages and its own unique character. Whether a frying pan with a non-stick coating or a classic with a stainless steel Cromargan® base, high-quality frying pans prove their quality time and time again. Our frying pans are manufactured in such a way that they still look great and function flawlessly even after many years of use. We recommend equipping your kitchen with at least two different frying pans: a coated frying pan for low-fat and gentle frying and an uncoated frying pan for flash frying meat. And when the frying pan is covered with the matching lid, the food can simmer away gently until it is cooked. The frying pan base with honeycomb structure is the most distinctive feature of the frying pans in the Profi Resist collection. The stainless steel honeycomb structure protects the underlying non-stick coating, creating a frying surface that is scratch-resistant, robust and virtually lasts a lifetime. The frying pan body is constructed using several layers and distributes the heat quickly and evenly, saving energy and enabling the correct cooking temperature to be precisely controlled. Thanks to their special base, the frying pans in this collection are suitable for all hob types, including induction. The modern generations of frying pan are ideal for intense searing. Specially designed frying surfaces and excellent heat distribution ensure that the pores of the fried food seal quickly when flash frying and that the inside of the steak or fillet remains succulent. Frying pans with a non-stick coating in particular are ideal for frying food using a little fat or no fat at all. This makes meat, fish and other fried food extremely digestible. Frying pans are designed for frying, but this is not their only purpose. As all-rounders, these practical cookware items can also be used for stewing and broiling, as well as preparing vegetable dishes, sauces and thinly sliced meat for example. For the best frying and stewing results, a great deal depends on the material.  WMF provides innovative coatings and materials for a long service life and the best results. We create frying pans that also meet the needs of professional chefs – innovative and with a focus on proven manufacturing methods. The corrosion-free stainless steel alloy is durable, acid-resistant and even after many years of use it still looks almost as good as new. WMF uses Cromargan® for cutlery, kitchen gadgets, pots and frying pans. The perfect material for 100% authentic taste. Durable and hard wearing, this unique functional ceramic was developed especially as a coating for health-conscious cooking. Forged aluminium frying pans, designed to be durable with a scratch-resistant and permanent, hard-wearing non-stick coating. Perfect for gentle and flash frying. Inside Cromargan®, outside CeraDur. The non-stick ceramic coating is extremely heat-resistant, very hard-wearing and perfect for flash frying at high temperatures.